Watts Series 152SS Stainless Steel Process Steam Pressure Regulators are used in commercial, industrial, and institutional applications to regulate steam pressure in autoclaves, steam tables/irons,vulcanizers and large capacity process services. It is highly sensitive to reduced pressure changes. 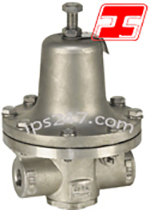 It consists of a stainless steel body construction with NPT threaded female inlet and outletconnections, stainless steel strainer, stainless steel seat, stainless steel diaphragm, Teflon disc, and sensitivity adjustment feature for critical flow. Series 152SS offers full volume with minimumpressure drop and in-line serviceability. It is ideal for use on sterilizers, process lines, testing fixtures, and oil lines. Tight seating Model 152SS-T available for dead end and liquid services.Maximum Supply Pressure: Up to 300psi (21 bar) at 420°F (216°C). Ideal for use on sterilizers, process lines, testing fixtures, and oil lines. Maximum Supply Pressure: Up to 300psi (21 bar) at 420°F (216°C).